Companies use common and pocket seals to emboss their share certificates and other important legal papers. Most private and public limited companies use common seals, which are available in two sizes – heavy duty table top common seal or pocket seal. The common seal is big in size and heavy in weight and difficult to carry around while pocket seal is compact in size, weight less and can be easily carried around. 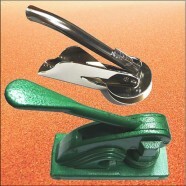 It can be folded and kept in your pocket when not in use, and is very easy to operate. We can produce common and pocket seals to use in your business documents. We need only 3 working days after the artwork is finalized and confirmed to create your seal for you. If you need it earlier, apply for our express service which comes with extra charges. We assure we offer competitive prices for our common and pocket seals, and guarantee complete customer satisfaction.